A stoping method in which relatively thin blocks of ore are caused to cave by successively undermining small panels. 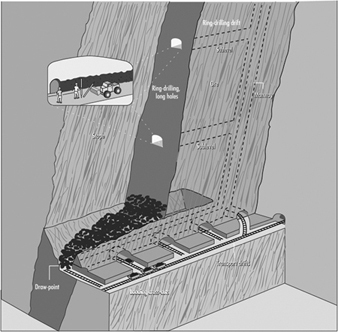 The ore deposit is developed by a series of sublevel spaced at vertical intervals of 18-25 ft or 30 ft and occasionally more. Usually only one or two sublevels are developed at a time, beginning at the top of the ore body. This method is used for thick and extra thick ore body. When the ore body is weak and moderately soft. When the hanging wall and footwall are weak. When the ore body is horizontal or has moderate stope. The ore body is moderately high grade. There is no dilution of ore during the working. The grade of ore is not much affected. Less timber required in this method. There is less loss of timber. The impact of caving on the working is less. Workers stand on solid ore.
During withdrawal of alternate broken odd number slice is mixed with rock. The recovery is less as compared to top slicing. Sorting of ore is not possible. The ore pass may be jammed. Clearing of ore is difficult.